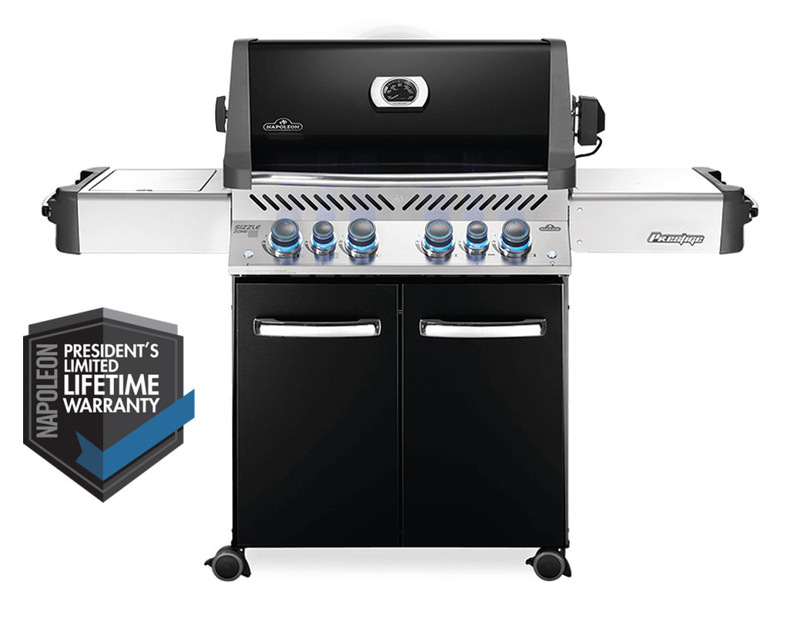 The Napoleon Prestige® 500 Propane Gas Grill with Infrared Side and Rear Burners is the total grilling package; with a stunning porcelain enamel black hood and stainless steel construction, this cart model has the capabilities of a full outdoor kitchen. With four main burners, an infrared rear and side burner, this grill can cook meals using eight unique cooking styles. Grill for a crowd with a capacity for up to thirty hamburgers, and up to eight more on the side burner. You'll know it's a Napoleon with the Iconic WAVE™ cooking grids for those distinctive sear marks. Not just durable on the outside; under the lid, is the same quality stainless steel used for the basin, tube burners, dual-level sear plates, and cooking grids. Seven stainless steel sear plates provide extra surface area for any drippings from your food to vaporize, avoiding flare-ups. Never leave your barbecue on again as all the Prestige® series grills come with the SafetyGlow Feature where the control knobs glow red when the burner is on. Gas is forced through ports in a ceramic plate and ignited, heating to 1800°F in 30 seconds producing high heat searing.